Ceredigion County Council acquired Cardigan Castle and the adjacent Green Villas cottages in early 2003 and commissioned this project to investigate and record the cottages and the area outside the present castle entrance. The Council’s intention is to renovate the cottages as offices in the first instance and as some form of ‘gateway’ to the castle in the longer term. This provided an opportunity to record in some detail the construction and fixtures of the cottages and at the same time carry out an archaeological excavation in the rear yard of the cottages in order to assess the presence or otherwise of any buried features associated with the castle. 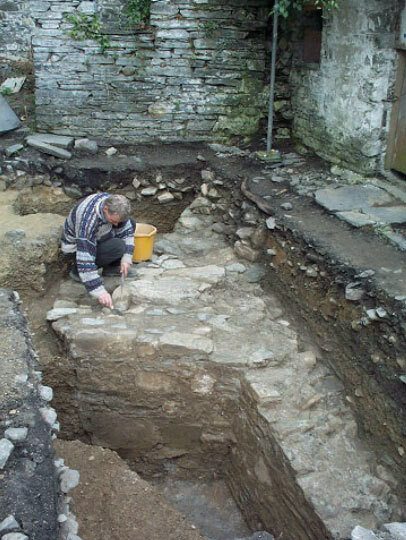 The investigation in the rear yard revealed substantial masonry remains of what appeared to be part of the medieval entrance structure to Cardigan Castle. The project has, for the first time, revealed medieval masonry on the western side of the castle and given a clear indication of the location of the gatehouse, a topic that has long been debated within the town. Cardigan Castle was first established on its present site as an earth and timber structure in 1110 by Gilbert Fitzgerald, although the first stone castle was built some 60 years later by Rhys ap Gruffudd (The Lord Rhys), who celebrated its completion by staging a festival of poetry and music, which is regarded as the first Eisteddfod. Another part of the project was the recording of the Green Villas cottages, which were built in the early 18th century. The cottages have had an interesting past. Both operated as pubs (The Castle and The Half Moon) during the later 18th and 19th centuries. The interior of The Half Moon had been modernised, but the interior of The Castle remains largely unaltered and has many interesting features. These include a large open range/fireplace and the wear patterns in the flagstone floor, which show where countless numbers of people have walked through the building and where they entered the downstairs rooms. The post-excavation phase of the project is on-going and a report will be produced in due course.